Cristal, the stunning restaurant of hot hotel Mar Hall, is both just outside Glasgow and also a million miles away. Mar Hall is a 19th-century Gothic mansion transformed into a very 21st century retreat, a perfect combination of classical elegance and modern luxury. Cristal boasts soaring vaulted ceilings, gothic paneling, lovely views over the gardens and grounds, and smart styling at eye level. Award-winning chef Jim Kerr has come from One Devonshire to thrill diners here with his classic dishes inflected with Scottish and Eastern accents. 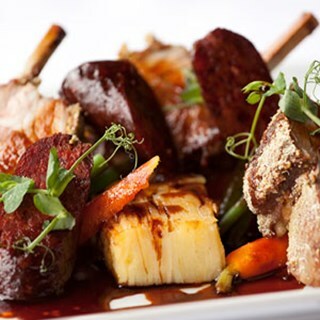 Dishes include starter of mussel and cornish crab stew, main course of panfried duck breast and confit leg with puy lentils and foie gras jus, and dessert of prune and walnut parfait with toffee sauce. Eager service, fine wines, relaxed ambience. I have to say Mar Hall did not live up to my expectations. Average service, great food however I won't be back. The service was inpecable. The young waiter  to attened to us was fantsatic at his job giving us service with a smile. He was extreamly polite and very knowledgeable in regards to the wines and menus. The food was outstanding !!!! I brought my mum along for Sunday lunch as part of her mothers day and we both had a lovely experience. Food was fantastic and our server (sorry I forget his name) was so polite, friendly and helpful. Food was delicious and was nice to see the chef come out and speak to diners. Lovely treat that we both enjoyed. Will highly recommend. We were there at 2pm on Sunday 24th March. If you could pass our thanks on again to our server as he was great. Fine dining at excellent venue. Staff were very attentive and informative. Will definitely go back soon! The Service was very nice, friendly and I felt fine. The Restaurant is beautiful. The food was fine, but in some cases it could be better. The bread was a bit tough and could have a bit more taste. I got the Foie gras as starter and this was the only dish I was not satisfied with. The brioche was more like a toast, it should be softer and it was burned. When I order a foie gras I expect a poached terrine not a mousse which taste was not very fine and tasted just slighly as a foie gras. The combination of the dish did not get very well together. The duck was great, perfectly cooked and the quality was amazing. The combination of the dish was also nice, only the side dish (I guess it was a potato terrine) could be more tasteful but it goes very well with the sauce, which was delicious, compliment to the Saucier. The dessert was also good. It could be more varied in the taste and structures, it was a bit too much mango but the Espuma was perfect so the creme. The arrangement of the dishes could me a bit more modern, it follows a very basic and traditional style, but this is just something which is up to the chef and the style he wants to follow. The waiters need guidance on how to pour wine. An excellent bottle of wine was completely destroyed when the waiter decided to top up our glasses to almost full. Until this experience I did not appreciate how important it is to treat wine with care and retain small quanitities in the glass. It was as if the waiter was filling tumblers of water. He did mean well and was very friendly but lacked basic training so perhaps not his fault entirely. In all other respects the service was very good and I would come back but will pour my own wine the next time. Have dined here several times. Very elegant dining room. Had a late lunch just before Xmas, the Xmas trees were beautiful in the grand hall. Staff were lovely, very attentive. A bit ironic thanking me for "dining with you" when the booking was cancelled only 8 days prior by Mar Hall as the restaurant was "unavailable for lunch" (or in other words someone was paying lots of money for the place, so to hell with other reservations!) despite the booking been made 2 months in advance - and my wife calling only the previous week to amend the day. Two emails regarding my attempt to show disappointment have been ignored. Gorgeous tasting & looking food. Worth the 5 star rating. Will definitely be back in the very very  near future. We were celebrating our wedding anniversary and although the food was of a good standard and the setting is beautiful, the service was very disappointing. We had to repeatedly ask for items - bread which wasn't brought, wine which we'd ordered,  re-fill of water glasses, coffee which we'd ordered. And,although the service was pleassant, it seemed amateurish as though many of the staff were new or in training, with some dishes placedon the table in a haphazard manner. The staff had clearly been directed to engage in small talk with the customers but, perhaps due to inexperience, this came across as stilted & a little awkward - it really didn't enhance our dining experience. In summary, at these prices & in this setting you would expect seamless, professional service which was far from the case. Interestingly, the much less important breakfast service the following morning was faultless! Hugely disappointed by this visit. Felt a bit like end of season and this seemed to be reflected in the quality of everything. I was expecting fine-dinning but this was middle-of-the-road. Based on this experience I am unlikely to be back. Sorry but you did ask! Fine dining. Excellent food, wine list, service in a beautiful setting. The pianist/singer in the lounge after dinner with coffee made for a memorable evening. We dined on a £60 gift voucher so our expectations weren't high. The starters and sweet were small but the roast beef main course certainly made up for it in quantity and quality, we were very impressed. The food was delicious and the staff were very attentive.